Samsung’s big Note 9 announcement took place today, and the 6.4-inch smartphone brought along some surprises too. We knew the latest Galaxy Note would take center stage at the company’s latest Unpacked 2018 event, but Samsung wasn’t ending things there, with more new hardware and feature upgrades. 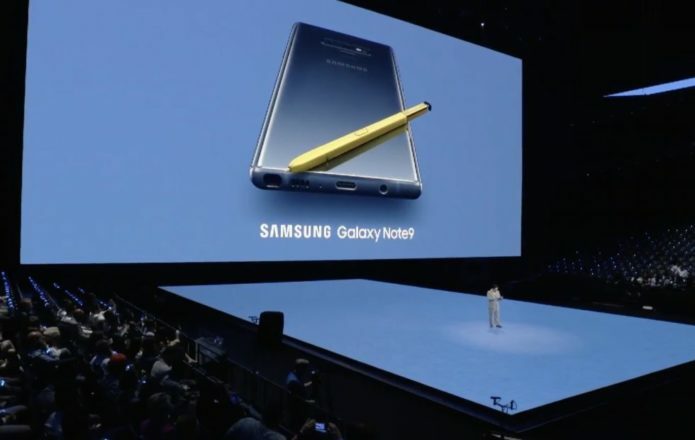 Undoubtedly the star of the show, the Galaxy Note 9 is Samsung’s newest phablet and the largest screen on a Note series device to-date. Up slightly from last year’s Note 8, to 6.4-inches, it continues Samsung’s track record of cherry-picking the latest and greatest in components. That means Qualcomm’s Snapdragon 845 inside, along with as much as 8 GB of memory and up to 512 GB of storage. On the back, meanwhile, is the well-esteemed Dual Pixel camera we’ve already seen from the Galaxy S9+, while the new S Pen slots into its silo on the bottom edge. No grand revolutions, but a solid evolution in all the key areas: a bigger battery, at 4,000 mAh, and Bluetooth LE in the S Pen to turn it into a useful remote control for the camera, presentations, music, and other apps. All while keeping customer favorites like a 3.5mm headphone jack and a fingerprint sensor. The downside, of course, is the price. We’ve seen smartphones climb in cost over the past couple of years, and the Note 9 is no exception. Figure on at least $999.99 if you want to preorder one from tomorrow, and $1,249.99 if you want the 512 GB version. DeX, Samsung’s attempt to replace your desktop PC by powering a similar experience from your smartphone, isn’t new, but in its third-generation it has seen the biggest changes yet. Announced as a Note 9 feature – though likely to be rolled out on other future Samsung phones – it does away with the complicated docking station we’ve seen before. Instead, it relies on a far more simple, and affordable, USB-C to HDMI adapter. Plug that into the Note 9 and any HDMI display, and DeX automatically loads up and shows a Windows-esque interface. It supports windowed apps for email, browsing, and more, and you can keep using the Note 9’s screen – and software – separately at the same time. If you’ve got Bluetooth peripherals, you can pair them with the phone. Otherwise, there’s an on-screen keyboard and virtual trackpad that use the Note 9 as the input system. It sounds like a minor change, but it should open up DeX to a much larger audience. The expense – and hassle – of a dock, after all, would put off those casually interested in replacing a PC or avoiding having to carry a laptop around. That, coupled with the high-end specs and plenty of storage, could make DeX the biggest deal out of everything Samsung announced for the Note 9 today. Samsung’s first surprise of the day was a new smartwatch, the simply titled Galaxy Watch. Gone was the Wear branding, though the hardware itself bears a striking resemblance to Samsung’s old designs. Still, with a bright circular display and a useful scrolling bezel, that’s no bad thing. The key thing here is Samsung’s own manufacturing proficiencies. Custom silicon means battery life that lasts a few days while still offering 4G LTE connectivity, for example. Tizen has plenty of smartwatch apps these days, and there are plenty of sensors for tracking health. If you’re picking up a new Note 9 and a new Galaxy Watch, Samsung has the wireless charger for you, too. It may have been announced later than the Apple AirPower, but Samsung’s Wireless Charging Duo looks set to beat it to market. Two Qi-compatible charging pads – one upright, the other flat – promise to fuel up both your must-have devices simultaneously. That’s one less than AirPower promises to deal with, mind, but Samsung does at least have a release date for its charger. Each of the pads offers 15W fast charging, and of course since it’s standard Qi being used, any device – including an iPhone X, iPhone 8, or iPhone 8 Plus – will work too. The fourth hardware item on Samsung’s agenda today was more of a tease than anything else. The Samsung Galaxy Home is the long-awaited Bixby speaker, the company’s take on a segment already dominated by Amazon’s Echo and Google Home. Like the Apple HomePod, Samsung is pitching superlative audio quality from its speaker, however, courtesy of AKG tuned drivers. Samsung isn’t just talking music, mind. The Galaxy Home will also be a SmartThings hub, acting as the Bixby-controled centerpiece to a full smart home installation. The big question, mind, is how much it will cost and when we can expect it in stores, and those are details Samsung is keeping to itself so far. The big services news at Unpacked 2018 today was Samsung hooking up with Spotify. After the demise of the little-loved Samsung Milk streaming music service, the phone-maker has been looking around for a media partner, and it found one in Swedish firm Spotify. That’ll mean Spotify baked into the setup process of new Samsung devices, like Smart TVs and smartphones. Bixby, when asked for music, will look to Spotify’s catalog first, meanwhile, even if the user doesn’t have an account with the service. Down the line, the goal is to have Spotify working on any A/V-enabled Samsung device in the home, with your music following you around whether it’s played on a Galaxy Home speaker, a Samsung TV, a tablet, or something else.